Ahead of the long-awaited fourth and final “blood moon” over the past year, the pastor and author who discovered the phenomenon that is aligning with biblical holy days predicts the world is on the brink of sweeping change. And that might not be a good thing for everyone. When Noory asked what Biltz specifically expects in the near future, the pastor said he sees the possibility of a major war involving Israel and an economic collapse. Biltz explained he is not looking to prophesy or say exactly what’s going to happen but is simply examining previous blood moon events. “Look at the patterns; it’s always meant war involving Israel,” he said. This time, he said, the final blood moon is lining up closely with the end of the seven-year Shemitah cycle. “It’s a sign based on the Shemitah cycle, which is that every seven years the land was to rest and there was to be an economic reset. And the last two times [this cycle ended], there was economic collapse. 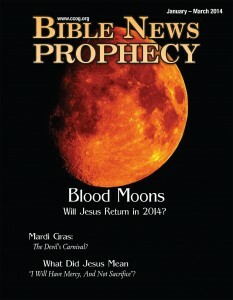 Biltz told Noory’s listeners people must pay attention to the blood moons and other astronomical events. “These are signs,” he explained. “I like to say that if you are driving down the highway and you see a sign that says bridge is out, you better hope it’s not out 10 feet away and is 10 miles away. I have spoken to people in and out of the Church of God who are dismayed by the natural blood moon eclipses. Just because several have coincided with biblical Holy Days does NOT mean that they have prophetic significance. People interested in prophecy really need to pay attention to what Jesus taught in Matthew 24 as He did not mention anything resembling blood moons as a sign prior to the start of the Great Tribulation. Now let’s address some questions related to WND’s article. Does the blood moon this month picture that there will be an economic collapse this month? Are there always blood moons around when Israel engages in some type of war? Does the Bible give any hint that normal ‘blood moons’ are of prophetic significance of themselves? The events involving the moon turning into blood are also tied into with the sun becoming black and a great earthquake. I have not seen any of the blood moon proponents claim that the sun was to turn black related to this in either 2014 (where there were two ‘blood moons’) or 2015 (where we had one, and one expected). Of the 38 largest earthquakes in the past few centuries, none of them were associated with the blood moons we have had in 2014 or 2015. That does not mean that we could not have one later this month. But my point is that I believe the ‘blood moon’ proponents have overlooked scriptural details about this. Was there a ‘blood moon’ at the end of Mark Biltz’s latest claimed Shemitah year? No. That claimed Shemitah year ended last Sunday at sunset. While some seem to believe the references related to blood moons in Revelation and/or Joel are some type of normal eclipse, it would seem to be more than that. Notice that those occur after the sixth seal is opened, which is after the opening of the fifth seal (Revelation 6:9), which is the start of the Great Tribulation, which has not started yet and cannot start until at least 2019 (see also When Will the Great Tribulation Begin?). Now, I have speculated that a temporal peace deal, like the one related to Daniel 9:27 (see also The ‘Peace Deal’ of Daniel 9:27), could come after a regional war involving Iran, Israel, and possibly Syria and/or the USA. The existence of the Jewish tradition may incline the Jews to accept a timed peace deal which will NOT turn out well for the tiny nation of Israel (cf. Daniel 9:27; 11:31)–but at this stage, it would not seem likely that such a deal would be confirmed on September 28, 2015. Those who believe the next blood moon is of biblical significance are being misled. Those of us who believe the Bible have the “more sure word of prophecy” (2 Peter 1:19, KJV). But some who are looking at some Protestant (including Messianic Judaism) teachings are overlooking various facts and what the Bible really teaches. This entry was posted on Wednesday, September 16th, 2015 at 2:20 pm	and is filed under Prophecy, Religious News.